Sometimes scientists struggle to prove the obvious: There is probably a study in progress right now to explain why you feel wet if a bucket of water is thrown on you. In that same vein, I did not say “aha!” and slap my forehead in astonishment at the results of research done by William Allen and his colleagues at University of Bristol (UK). Basically these guys were exploring why some big cats have spots and some don’t. I’m going to assume that you have not recently conducted extensive research in that area yourself, yet you knew that it had something to do with camouflage, right? 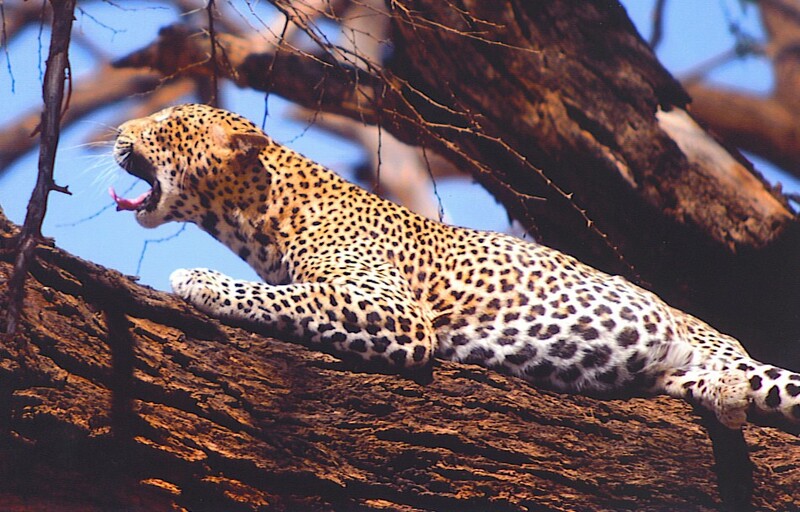 If you’ve seen any nature documentaries, you’ve watched leopards or lions sneak up on their prey and then pounce. You figured the coat patterns (or lack thereof) helped the big cats blend into their environment. If that’s what you thought, good for you — Dr. Allen and his team have proven you right! Yes, most cats (with the notable exception of cheetahs) stalk and ambush from relatively short distance, so the camouflage on their coats allows them to get close to their unsuspecting next meal. Apparently there had previously been an alternative hypothesis — one that hadn’t occurred to me — that the spot patterns were some sort of signal between cats of the same species. Nope. The cat’s coat has no relationship to its sociability. Another unanswered question is why cheetahs have spots. I have personally witnessed them hunting gazelles in Tanzania, and I can tell you that cheetahs would blend into their environment a lot better without the spots. It’s also unknown at this point why coat markings in some species change as the animal matures. For that matter, do coat patterns evolve over generations, as the animals’ environment changes? It may be up to other scientists to answer these questions; Dr. Allen has already moved on to a new study about color and pattern on snakes and certain mammals, such as giraffes. Let me think… do you suppose he’ll eventually learn that it has something to do with the creature’s habitat? And by the way, has it been conclusively proven that a bear defecates in the woods? This entry was posted in Science and tagged big cats. Bookmark the permalink. I’d be curious to hear Dr. Allen’s take on house cats. Why such a big variation between say a Siamese and a Tabby? Would it be dictated by the type of couch that they decide to curl up on all day? I envision several dissertations that will be groundbreaking, as well as cures for insomnia, from the questions you raise. Academia will be grateful. Maybe cheetahs have spots to give the rest of the food chain a fighting chance against the fastest land animal … or because they make for a more attractive mascot for Cheetos. Your Cheetos logo hypothesis hadn’t occurred to me. Perhaps the Frito-Lay Company would like to fund a study.